Synthetic Vehicular Natural Gas Engine Oil’s low-ash formulation helps minimize valve stem and combustion chamber deposit formation. 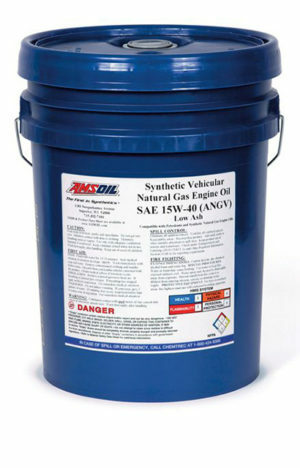 It is designed to reduce valve recession, a common problem with low-ash oils. Its balanced formula allows for a high total base number (TBN) to neutralize acids and protect against corrosion while meeting low ash requirements. AMSOIL Synthetic Vehicular Natural Gas Engine Oil is a long life oil that has demonstrated extended drain interval capabilities when carefully monitored by an oil analysis program. When extending oil drain intervals, change the oil filter at the engine manufacturer’s recommended interval. AMSOIL PRODUCT WARRANTY AMSOIL products are backed by a Limited Liability Warranty. HEALTH AND SAFETY This product is not expected to cause health concerns when used for the intended applications and according to the recommendations in the Safety Data Sheet . Keep Out of Reach of Children.